The Mirror is a very popular sailing dinghy, with more than 70,000 built. The Mirror was named after the Daily Mirror, a UK newspaper with a largely working class distribution. 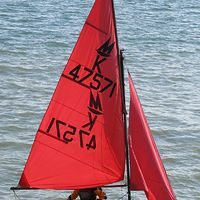 The Mirror was from the start promoted as an affordable boat, and as a design it has done a great deal to make dinghy sailing accessible to a wide audience. Although most popular in the UK, Mirrors are also sailed in other countries, notably Australia, Ireland, Sweden, Canada, the Netherlands, South Africa, New Zealand, the Philippines and the United States.